Summer is here and when it’s this hot, I am always looking for something light and refreshing to make, and this luscious and healthy Southern Watermelon Tomato Salad checks all of the boxes. Delightfully quick and easy Southern Watermelon Tomato Salad is full of summer’s bounty with fresh juicy sweet watermelon, ripe summer tomatoes, tangy feta cheese, and slivered almonds. 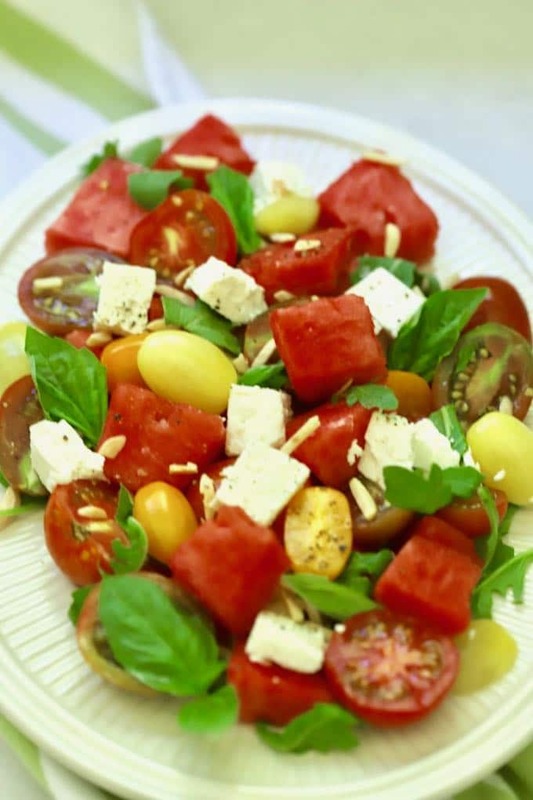 And, this watermelon salad is ideal for your summer cookouts, supper clubs, potlucks, weeknight meals, brunches, or lunches. It’s the quintessential summer side salad and is perfect for any occasion. I make this summer fruit salad all the time and whenever I bring it to a potluck everyone asks for the recipe, now I can’t wait to share it with you! 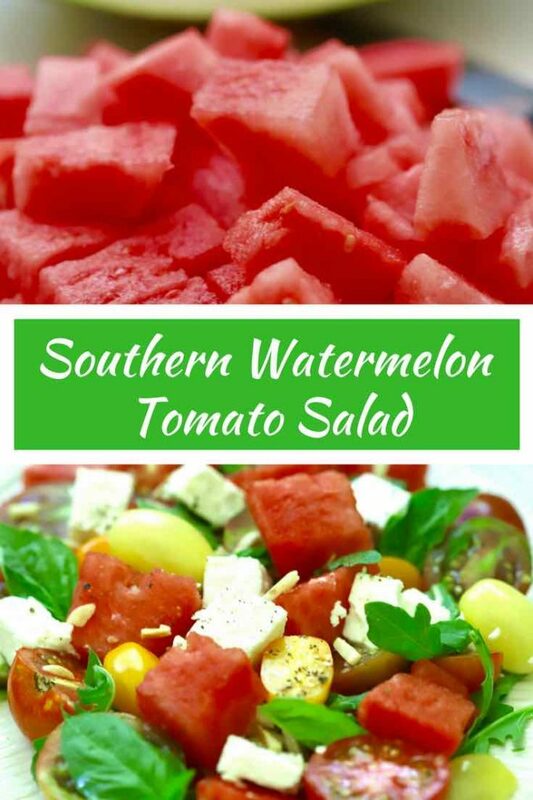 My hope is you will try this easy Southern Watermelon Tomato Salad soon, and that you will love it as much as we do! 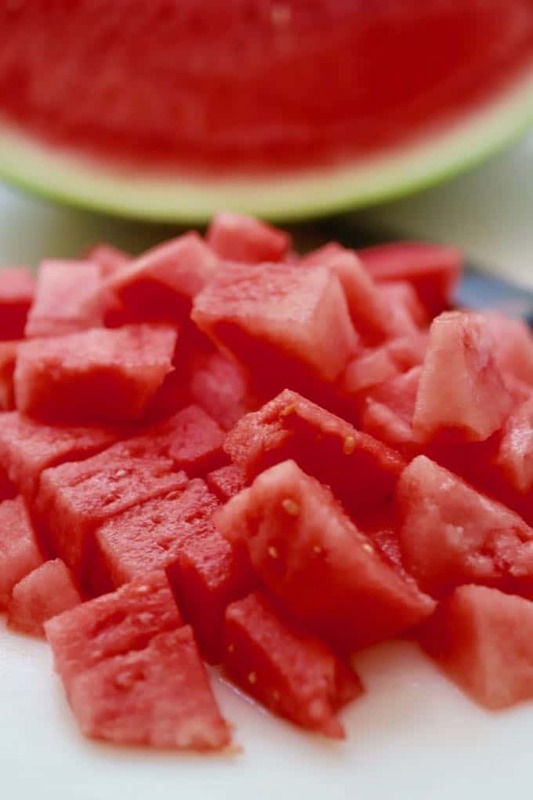 Watermelon is nutritious and loaded with fiber, and a two-cup serving only has 85 calories. 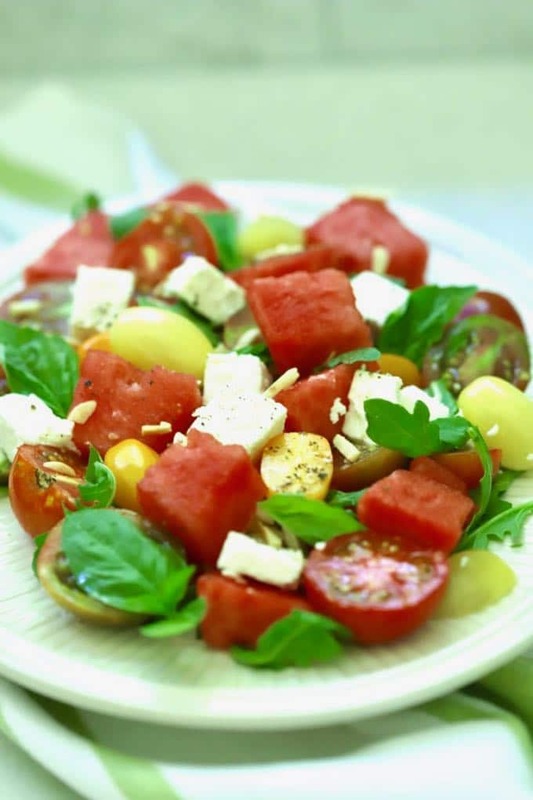 This summer-in-a-bowl watermelon salad has only 250 calories per serving, which includes the dressing and it supplies over half of your daily vitamin C requirement. The ingredients are simple: fresh ripe watermelon and tomatoes (heirloom if you can find them in different colors, or you can also use cherry tomatoes) baby arugula or other salad greens, feta cheese, toasted slivered almonds, fresh basil, kosher salt, extra virgin olive oil and red wine vinegar. That’s it! Toasting the almonds adds flavor and crunch to this salad. To toast, simply put them in a small dry sauté pan over medium heat. Cook for about 4-5 minutes stirring frequently to make sure they don’t burn. The almonds are toasted when you start seeing some of the slivers develop a light brown color. Combine the watermelon and tomatoes in a large strainer over a bowl and add 1-2 tsp(s) of kosher salt or fleur de sel. Mix carefully and let stand and drain at least 15 minutes or up to 1-2 hours until you are ready to serve the salad. To make the dressing, mix the olive oil and vinegar in a small bowl or mason jar and whisk or shake well. When you are ready to serve the salad, first put the arugula in a large shallow bowl or on a platter. 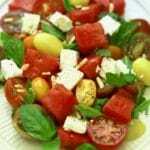 Place the watermelon and tomato mixture in a large bowl or large plastic bag and add the dressing. Mix well but carefully. Then spoon this mixture on top of the arugula. Sprinkle with the feta cheese, slivered almonds, and chopped basil. Serve immediately and enjoy! Full of summer's bounty with juicy sweet watermelon and fresh tomatoes, this delightfully easy Southern Watermelon Tomato Salad is the perfect summer side dish. To make the dressing, mix the olive oil and vinegar together in a small bowl or mason jar and whisk or shake well. When you are ready to serve the salad, first put the arugula in a large shallow bowl. Put the watermelon and tomato mixture in a large bowl or large plastic bag and add the dressing. Mix well but carefully. Then spoon this mixture on top of the arugula. Sprinkle with the feta cheese slivered almonds and chopped basil. Serve immediately and enjoy! To toast the almonds, simply put them in a small dry sauté pan over medium heat. Cook for about 4-5 minutes stirring frequently to make sure they don’t burn. They are done when you start seeing some of them develop a light brown color. This recipe can easily be modified to make more or fewer servings. Beautiful salad and looks soooooo yummy. I dearly love watermelon too but you know who will not eat it. I’ll just have to make this for myself. Thanks for sharing this recipe.